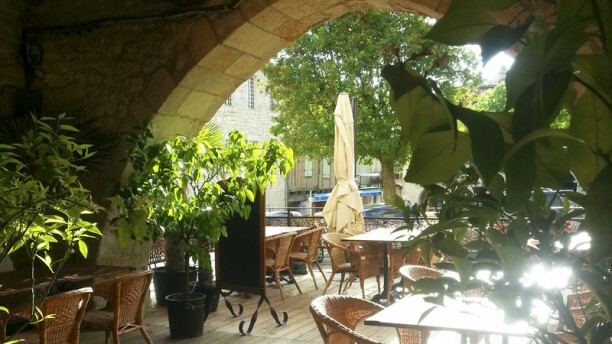 LIBANAIS COSY - Au cœur de la bastide médiévale de Monflanquin, "l’un des Plus Beaux Villages de France", on fait un stop exotique dans ce resto libanais super chic. Chez Aldayaa, on a bon goût et ça se voit : mobilier en bois brut, fleurs fraîches et couleurs poudrées pour une ambiance 100% zen. FARANDOLE DE MEZZÉS - Voyage culinaire oriental assuré avec les fatayer, man’ouché, rekakat, falafel, hommos, moutabbal et autres tabboulé libanais. Quant aux desserts, ils valent le détour : opterez-vous pour l’awamet - beignets au yaourt nappés de sirop d’agrumes à la fleur d’oranger – ou l’haytalié - crème de lait à la fleur de maïs nappée de sirop d'agrume ? DOGGY BAG ACCEPTÉ - Assez rare en France pour être signalé : ici, les clients peuvent emporter les mets et les vins non terminés… Non au gaspillage et oui au frigo plein de délices exotiques ! Another excellent meal, never disappointed with the quality of food and service at this lovely restaurant..
Al fresco dining with a convivial atmosphere in one of SW France's most idyllic bastides. Go for it, you won't be disappointed. The service was excellent, considering every table was full and we arrived a bit late. Top marks to Maria for her excellent service, and very helpful suggestions re the menu. Will visit again soon. Our 4th visit to this great restaurant. We've never been disappointed with the quality of food and friendly service. Another excellent lunch. lovely ambiance. We enjoyed our meal at this Lebanese restaurant. Not many of these in sw France so made a pleasant change. Meat mixes. Good quality chicken and lamb, sauces of choice, a good size portion of chips, pitta bread too. Accompanied by a very acceptable half bottle of Lebanese wine. Quite a long wait between main course and being asked re desserts or coffee. But we were not in a hurry. Staff pleasant. Even though a 40 minute drive from home we shall return. Recommended. What a lovely restaurant, very friendly staff and excellent food. Good food served with a smile well worth the visit ! Just fantastic great food and wine superb service. Well done! A feast of wonderful flavours served with care and attention. The restaurant had been recommended to us by friends and we were definitely not disappointed. We had one of the set menu options. All the courses were very tasty and well presented by an attentive waitress. We thoroughly enjoyed the experience and have already booked again for our wedding anniversary along with our kids for next week. Again, top quality fresh food, presented well. Always confident the food will be at the same standard..
We have eaten here many times and have always been full of praise for the whole experience. Last night the food was probably the best we have had there, many thanks to the team. You are most Welcome... Hope to see you very soon. Not the first time we have eaten there and it will certainly not be the last. Each time there is a change to the set 28 euro menu and each time it gets better.